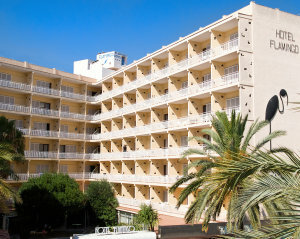 Hotel Flamingo, Lloret de mar...we stayed here in June 2010 and again at the end of August and enjoyed it very much, we had a newly refurbished room on the first floor but i believe the work on the other floors is now complete. The room had two standard beds, TV on the wall and quite a large balcony with a table and chairs, the bathroom was big and clean with lots of marble, quite plush. The reception was light and bright with extremely friendly staff, there is a pleasant seating area with views out to the pool. The location is fantastic, set back from the busy 'club street' you get a view of the 'action' without really hearing it and the beach is just a couple of hundred metres away, we really enjoyed our stay at the Flamingo.